Happy Thursday friends! Four years ago, I wrote a post that has remained one of my most popular posts which discussed 26 Ways to Help a Friend with Chronic Illness. It was widely appreciated by those who have a chronic illness and those who love someone with a chronic illness. As time went on I started to receive some emails asking if there were any specific thoughts or ideas on how to reach out to someone with a chronic illness during the holiday season. (Y'all are AWESOME. Seriously. I love emails like this- they are such an encouragement to my little heart!) So I wrote a post entitled, 17 ways to help a friend with Chronic Illness during the Holidays. (There is also a 30 Christmas Present Idea list for a friend with Chronic Illness that can be found HERE if you are interested and a 35 Christmas Present Ideas for Lyme Patients post that can be found HERE!) 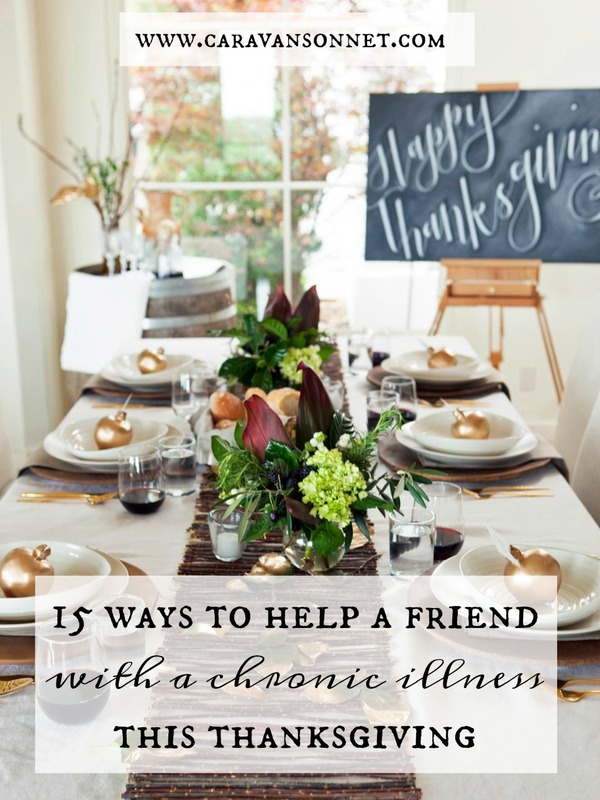 Two years ago I shared 15 ways to help a friend with a chronic illness during the thanksgiving season and today I wanted to re-share some of these ideas again with some updated thoughts! I hope that this list helps! I am not an expert at all, but the things that I have listed below are things that friends have mentioned to me that have been wonderful or I have personally experienced that has truly touched my heart and my life during this holiday season, especially when I was very sick. 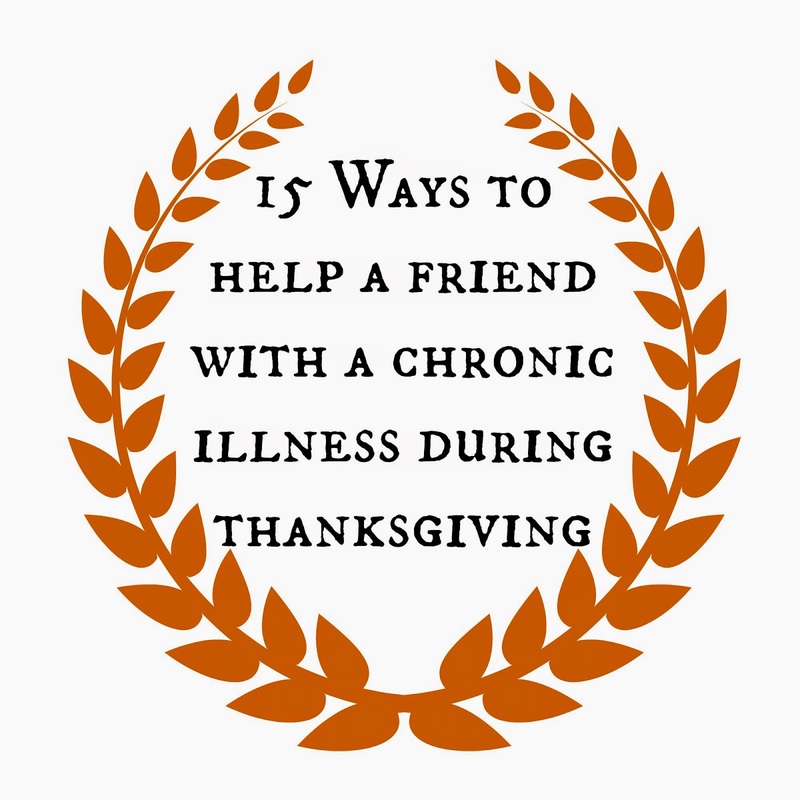 So (in no specific order) here are 15 ideas to help a loved one with a chronic illness during the Thanksgiving holiday! The holidays can be stressful for people and this is especially true of those with chronic illnesses. 2. When hosting a dinner party (or a get together) take the time to share with your chronically ill friend ahead of time the ingredients of all of your dishes. This will save your friend any awkwardness of having to ask questions in front of the other guests and feel like a burden at the party. 3. When hosting a party- offer some foods that your friend (who is on a special diet) can eat. Don't make this a big deal but try to incorporate snacks (or leftovers) that you know your friend can eat. Understand that money is tight and that the holidays are incredibly stressful for your friend. Hosting a thanksgiving get together (even if it is "their year") can be extremely taxing on those suffering with chronic illness. I know I was told by one friend, "if it was just us, we would be eating eggs and toast because money is so tight but instead we have been missing treatments, not buying supplements, etc. for a couple of months just to save up to feed the family because it is our responsibility this year". Yikes! Unfortunately this is the case all too often. Be incredibly sensitive to the time, energy, and money that may be spent and try and help out with any (or all!) of these things! Helping those who are less fortunate, serving at the homeless shelter, etc. are all wonderful ideas but have you ever thought about serving those who are even closer to you? Your chronically ill friend is in serious need. Consider serving those closest to you this year! 6. Offer to go grocery shopping (and pay for the groceries) for your friend. This was such a great idea! Shopping is absolutely exhausting for a chronically ill person, but during the holidays it can be truly detrimental. Not only are their long lines and tons of people but often times there is more of a chance of someone picking up germs due to these large crowds. You most likely are already going to the store- why not ask your friend what you can pick up for them? Another idea? Why not get double of everything you are getting and then drop it off at their house (with the receipt). They will keep what they can use and exchange anything that can't be used. Such a simple but helpful thing for those who are ill! Things may look different with your friend and family members who are seriously ill but remember that they are still the same person in their hearts. Be patient with the changes. 8. Laugh often with your friend or family member. Maybe offer to bring over a comedy to watch together, send a funny card in the mail, or just leave a message that could bring a smile to their face! 9. Don't make it about you. 10. Consider starting new holiday traditions. Yes, you have stuffed yourselves with Turkey and always played flag football for the whole afternoon finishing the day off with a movie marathon and then starting your all day Christmas shopping at midnight on Black Friday and that has been wonderful for years (or decades or generations) BUT... just reading that list may be exhausting for someone who is sick let alone being able to do 1/2 of those things for a chronically ill person. Why not start new holiday traditions while keeping the old ones? BE Creative. BE open. Your love and compassion will be the best holiday gift you could give someone. 11. Take up a secret holiday collection and give it to your friend before Christmas. Why not surprise your friend with an early Christmas present and give it to them at Thanksgiving. Believe me... they are not going to be spending it on themselves unless it is for treatment but even then they probably will use it to buy Christmas presents for their loved ones. 12. Celebrate the simplicity of the holiday season. Holidays are about PEOPLE. Not a tradition or a "pinterest worthy" house... but people. Spend the energy and love on the people who are hurting. This is how I describe things to those who don't know me sometimes. "Remember how poorly you felt when you had the flu last year? Remember the headache and the backache you had last week? Remember when you had mono as a college student? Put all of them together and times it by ten and you have close to what I am feeling all of the time. Now if you felt that way... what would you like to do for the holidays?" Be thoughtful - put yourself in the others persons shoes. 15. Realize that your friend or family member with chronic illness is the best gift this season. Their illness is forcing them to set limitations but the gift to you is remembering what is truly important in the holiday season. Celebrate PEOPLE. Not things or activities. At the end of the day people are the most important thing not whether or not you were able to buy every single gift in the world. As I continue to heal from my health issues I look back and think about all of the grace that has been shown to me over the last several years and holiday seasons. One of the biggest gifts that I have received is the love and support of family and friends in this journey. If you ever feel like you wish you could do more, especially at the holiday season- know that your love and compassion and grace will be a gift that will last in their hearts forever!